Welcome to the age of the great guilds! we hear the narrator say and our magical journey begins. 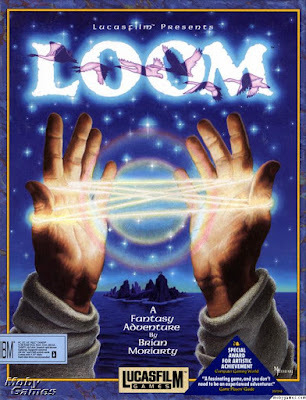 20 years ago Loom was released by Lucas Arts and after all this time it still manages to lead us in its mystic world. This is one of the most enchanting games (adventure games for that matter) that i have ever played. Swans, music, art guilds, magic all blend together in a way to offer us a unique experience. You are Bobbin Threadbare, the Loom child, a young man of the guild of weavers, off to find answers to your questions and possibly save the world. I will not go into the details of the story 'cause I don't want to ruin it for anyone. When the game came out in retail 20 years ago in the box there was a cassette containing an audio drama that helps the player get into the game world and story. I strongly suggest you hear it. You will thoroughly enjoy it and it is only 30 minutes. You can find it on youtube in three parts: Part 1, Part 2 and Part 3. Having just finished the game again after so many years I still find it refreshing, unique and immersing. I simply did not want it to end. Being an adventure game you solve puzzles in order to progress into the story. 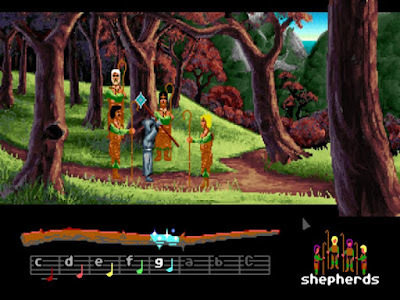 In Loom though the puzzles are not you usual inventory based, slider or mechanical puzzles in other games, but rather, a unique use of musical notes. You wave your stuff to play music and according to the melody something happens. So basically, you have melodies that perform certain actions and you use them when you want something done. You hear this melodies when something is happening and then you play them again to perform an action. This works very well and its use blends wonderfully into the game world. There are many ways to use a melody. For example if you play the melody of 'open' backwards, you close something! The game is rather easy and short. An experienced adventure gamer will finish it probably in an afternoon and that is the game's biggest drawback. In order to extend its length you can play it in a higher level of difficulty. The different levels of difficulty do not have to do with the puzzles themselves, but instead with, how the notes are presented to the player. In the easiest mode the game shows you the notes of the melodies that you hear in order to play them again. In the highest difficulty mode you play the game by ear alone. In any difficulty level though, it is essential to note down the melodies and what they do, which is fun on its own. The game's finalle clearly suggest that there will be a sequel, but 20 years have passed and nothing. 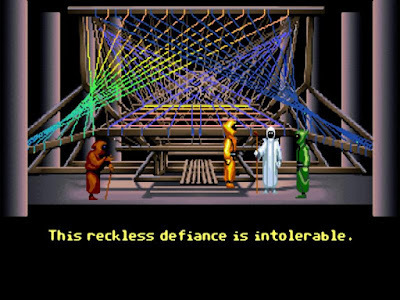 I would have really loved to play the next Loom game but unfortunately Lucas Arts probably is not going to give us one. You can get this game from steam for a very low price, or try your luck in Ebay. If you encounter any old disks of any version(PC disks, Amiga CD, FM Towns, etc) it will play wonderfully with ScummVM. I strongly suggest this game to anyone that likes a good story and an immersing experience in a magical world.